Segnalazione giusto per chi negli ultimi mesi è stato sulla luna: oggi è il giorno del lancio europeo della PSP. Cliccate continua se volete leggere il comunicato stampa di Sony Scee (in inglese). London, 1 September 2005 – Sony Computer Entertainment Europe (SCEE) today launched its eagerly anticipated PSP™(PlayStation®Portable) handheld entertainment system across the European market and throughout Australia and New Zealand. Following the success of the PSP launches in Japan and the USA, and with over 5 million PSP systems already shipped worldwide, PSP launched today in a single version Value Pack, priced at €249 (£179). The PSP Value Pack contains an added-value package of accessories and entertainment content, including the PSP system with a pouch, 32MB Memory Stick Duo™, Battery Pack, Headphones with Remote Control, AC Adaptor, Wrist Strap, cloth and a video/music/game sampler Universal Media Disc™ (UMD™) including several game demos. A copy of Spider-Man 2 on UMD Video will be available free of charge to early purchasers of PSP, who register their PSP through http://www.yourpsp.com. The official SCEE web portal for PSP, http://www.yourpsp.com allows PSP owners to view trailers and screenshots from a wide selection of PSP Game, UMD Video and UMD Music titles, as well as accessing the latest software updates and a host of regularly updated competitions, news and features about PSP. Consumers will also be able to download exclusive content to their PSP. PSP in Europe will launch with over 30 game titles, all of which have been developed especially to exploit PSP’s stunning high resolution TFT widescreen display. Featuring classic PlayStation brands that have been re-invented for the new format, alongside some all-new properties, the games catalogue offers something for everyone. For speed demons, there’s the new turbo-charged Ridge Racer™; sport fans can showboat their skills in World Tour Soccer and Everybody’s Golf™; there’s madcap monkey madness in Ape Academy™ with mini-games ranging from monkey hockey to the ‘1m Dash’; and the legendary MediEvil™: Resurrection delivers action, humour and an adventure that will challenge all levels of gamer. A key feature of the PSP is its Wireless LAN capabilities, enabling users to connect to the internet via a ‘WiFi hotspot’ and play online across a Wireless Network. 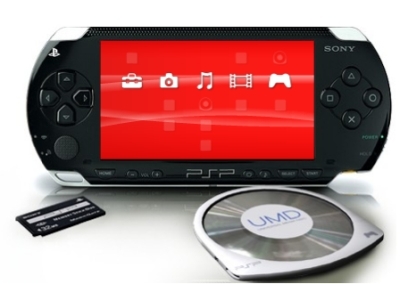 In the wireless Ad Hoc Mode, up to 16 PSP systems can also be connected to each other directly, allowing for head-to-head competition with other players in the immediate vicinity. PSP has also received incredible support from third party game publishers, and there will be over 20 third party game titles available during the initial launch period from the world’s top publishers, and over 50 before the Christmas peak selling season gets under way. The resounding success of the UMD Video format in the USA is further proof that PSP offers an all embracing entertainment experience. PSP will launch with 30 movies from a variety of top Hollywood studios including Sony Pictures, Twentieth Century Fox, Buena Vista and Universal. With studios now planning to release ‘Day and Date’ with DVD releases, and an extensive catalogue of some 100 movies scheduled for release on UMD Video by Christmas, European PSP owners can look forward to an unmatched choice of entertainment. The enjoyment of listening to music is a key part of the PSP’s exciting entertainment offering and, in addition to playing music stored on the Memory Stick in MP3, ATRAC 3plus and MPEG-4 AAC format, UMD Music videos will also be available. During the initial launch period, three classic music videos will be available from Sanctuary Visual Entertainment; Iron Maiden – Rock in Rio, INXS – Live Baby Live and Bob Marley- Live from Santa Barbara. Along with eight titles from Sony BMG including compilations from Usher, Outkast and The Offspring, and live concerts from Foo Fighters, Rage Against The Machine, Good Charlotte and Incubus, with many more music videos scheduled for release in the run up to Christmas. “PSPs for the European market will also benefit from the latest system software upgrade”, explained David Reeves, President of SCEE. “The European PSPs will contain the latest and most up to date software available. With the introduction of an internet browser to ease the downloading of game trailers and video content from WiFi hotspots, a new codec for optimising the quality of video content on Memory Stick, and a wealth of other improvements to enhance the user experience, European consumers will not only be receiving the most sophisticated and exciting portable entertainment device ever made but will be able to upgrade their PSP’s continually as new functionality is announced”. Retailers throughout Europe will be opening their doors at midnight on Wednesday 31st August to satisfy the enthusiasm of fans, keen to get their hands on one of the first European PSPs.